Among the things I was not looking forward to among all of Disney's new Star Wars offerings was another Aftermath book. 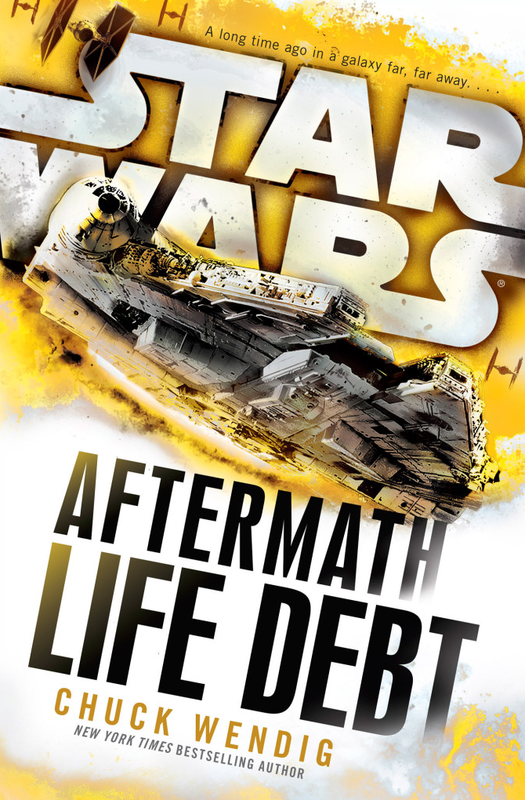 So it was with great hesitation I borrowed, not bought, Aftermath: Life Debt by Chuck Wendig. Because honestly, I could not have any lower expectations! Wendig throws his readers early into the action. We join Norra Wexley and her band of Rebels (or New Republic commandos), comprised of surviving characters from the last book, as they serve as an extraction team. They find, kidnap and extract Imperial war criminals so they can be tried for their atrocities by the New Republic. However, the actions of others pull her into a different story. Princess Leia calls upon Wexley and her crew to find and return another type of scoundrel. Her husband Han Solo has gone missing. His partner Chewbacca was captured in an attempt by the pair to organize an attack to free the Wookie's home world Kashyyyk from Imperial control. Solo refuses to come home until he can recover his partner despite his wife's pregnancy. But do Wexley's actions fill the needs of the New Republic or the Imperial remnant and its leader Grand Admiral Rae Sloane and her secret advisor? And can you team survive the strain of the twists and turns of this adventure? Let me just jump to the big reveal, and that's not the home world of the Imperial secret advisor! I loved Aftermath: Life Debt. It started hard for me, as I could not remember who all these new heroes from the first book was. So watching a group I did not really know extract an unknown to me villian in a new to me setting, I was a little lost. But within the first 30 pages it turned quickly for me. I began to identify and feel for Norra's band. I found I cared for this group, their emotions and what was going to happen to them. The group is largely a team of dubious personalities, so just the question if how do former bounty hunters and imperials move forward within the New Republic was fascinating. And unlike Bloodlines, it had just enough politics. I t is close enough to the Rebellion we see how Leia struggles with the new politically correct structure the New Republic is becoming. That is even more interesting and helps advance Leia closer to the Resistance intellectually more then the actions of Bloodline. And Wendig makes me care about the politics outlined in this book as the New Republic debates what can they do for Kashyyyk, a work full of Wookies that I do care about. In the first book of the trilogy Wendig touched briefly on classic Star Wars heroes. In this volume he goes all in. And so we get Han Solo...and a lot of him. And it is the Solo we want and hope from, a lovable scoundrel. Wendig does a nice job highlighting the Solo/Chewbacca relationship, even when the Wookie is not there. He makes it clear the Chewbacca is not a sidekick or pet. Chewbacca is an equal partner! And the descriptions of this relationship really further cement how I feel about this dynamic pair. But that's not to say I do not care about the new heroes. Norra is a good examples. She's a former Rebel, a soldiers, a mother to the future Snap Wexley, a wife to a missing husband and more. I care about her future and her relationships with not just her team but also her family and potential love interests. And honestly I could not say that after the first book! I really enjoyed Aftermath: Life Debt. I do not always recommend many Star Wars books bases on plot and writing. This however is one I fully recommend!